Margin between the CAQ and Liberals is razor thin heading into Monday's Quebec election, but François Legault is still in the running for a majority government. When Quebec's election campaign began 38 days ago, Coalition Avenir Québec Leader François Legault was the favourite to win a majority government. A few gaffes and ill-defined policy proposals later, Legault's odds of securing that majority have dropped to no better than a coin-toss. But if he has a little luck on his side, the ingredients are there for the centre-right CAQ to reach the 63-seat mark necessary to control Quebec's National Assembly — despite his party enjoying the support of less than one-in-three Quebecers. The CBC Quebec Poll Tracker, an aggregation of all publicly released polling data, suggests that the CAQ sits at 31.8 per cent support. That puts it narrowly ahead of Philippe Couillard's Liberals, who have 30.1 per cent support. That's a much narrower margin than the eight-point lead the CAQ held over the Liberals early in the campaign. 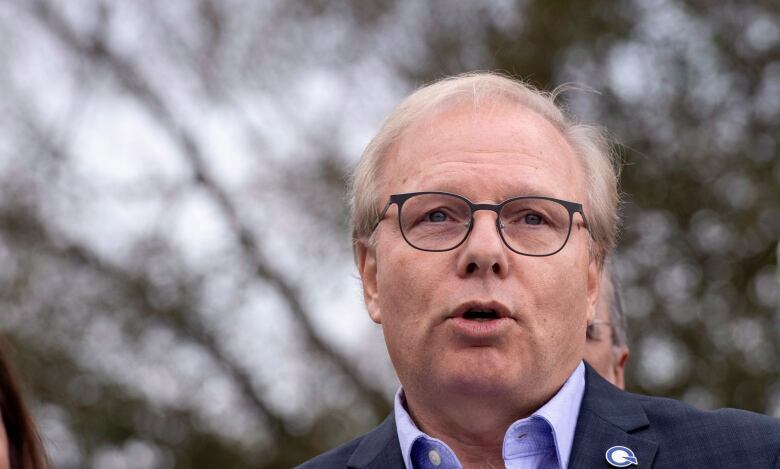 But it isn't Couillard nor Jean-François Lisée and the Parti Québécois, which stands at 18.8 per cent support, who have been most responsible for the CAQ's slide in the polls. 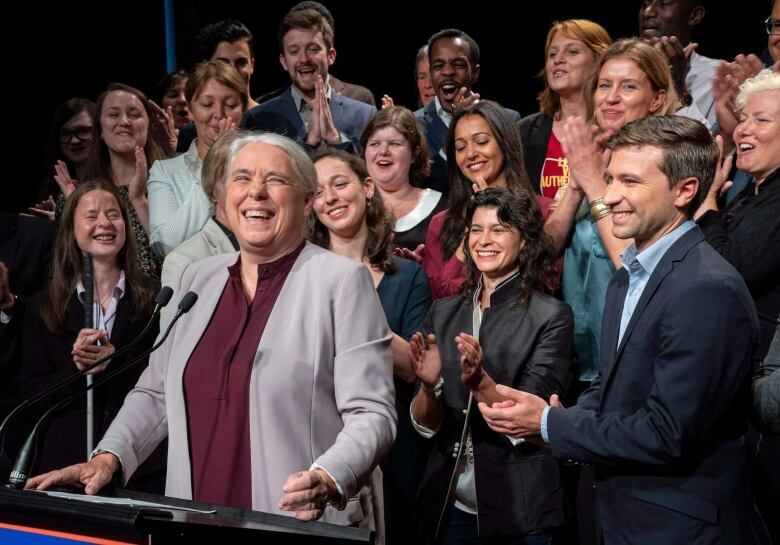 Instead, Manon Massé's left-wing Québec Solidaire has had the momentum over the last few weeks. The party, which captured just 7.6 per cent of the vote in the 2014 provincial election, is now averaging 16.3 per cent in the polls. Despite the small gap between the CAQ and the Liberals, there is little polling uncertainty in where the parties stand. The three most recent polls of the campaign, published by Ipsos/La Presse-Global News, Mainstreet Research/Groupe Capitale Médias, and Léger/Le Journal de Montréal this past week, differ by no more than two points between any of the parties. That indicates the stability there has been in the numbers. The CAQ has registered between 29 and 32 per cent support in nine consecutive polls, though the latest results all suggest a modest rebound at the expense of the PQ. The last six polls have put the Liberals between 29 and 31 per cent. There are still, however, a lot of unknowns going into Monday's election. The Poll Tracker suggests there is a 50 per cent chance that the CAQ will win at least the 63 seats required to form a majority government. Their range of seats runs from 48 to 81, a wide band suggesting plenty of close contests throughout the province — some of them involving all four major parties. The Liberals are estimated to have about a one-in-12 chance of winning the most seats, a result of their historically low support among francophones. The party is projected to win between 29 and 55 seats — well short of the majority threshold. But there is enough overlap with the CAQ that the Liberals could emerge with more seats, particularly if their support is underestimated in the polls. The Parti Québécois is at risk of losing official party status in the National Assembly, which requires at least 12 seats or 20 per cent of the popular vote. The polls suggest the party may fall short of the latter, while the projection model puts them at 11 seats. However, they are involved in many tight races — trailing the CAQ by five points or less in seven ridings according to the Poll Tracker — so a small bump at the ballot box could make a big difference. As for Québec Solidaire, which held only three seats at dissolution, the party could double or even triple its representation in the National Assembly. The model awards the party nine seats — as many as six on the island of Montreal, its traditional base of support, but also one in Quebec City and two in the rest of the province — but sees a potential for even more upsets if the party's momentum continues through to Monday. But QS could easily fall short of this target, as the party is strongest among young voters, who historically have a low turnout rate. No party in Quebec has won a majority government with less than 38 per cent of the vote, making the coin-toss odds for a CAQ victory at under 32 per cent a historical anomaly. But the CAQ has a number of decisive advantages over its rivals. The most important is its support among francophones, estimated to be 37 per cent by the Poll Tracker. That gives the CAQ a 14-point lead over the PQ, which sits at just 23 per cent support. Québec Solidaire is tied with the Liberals at 19 per cent. Francophones make up about two-thirds or more of the population in 100 of Quebec's 125 ridings, so the CAQ's wide lead among this demographic gives them a key edge in their potential seat count. Regionally, it translates into commanding leads in the Quebec City region and the suburbs around the island of Montreal, and in the rest of the province outside of the two major urban centres. Only in Montreal do the Liberals hold a lead, thanks to their dominance among non-francophones. The CAQ is about 30 points behind the Liberals on the island, suggesting they may struggle to win their first seat there. But there is little additional ground in Montreal for the Liberals to gain. Majority, minority, red or blue? Put together, the numbers suggest that the CAQ is very likely to win the most seats and has a good chance of squeaking by with a majority government. Those chances will improve if the Parti Québécois, floundering in the final week, continues to bleed support to the CAQ. The CAQ would also benefit even if the PQ loses voters to QS instead, as the CAQ and QS are not competing for many ridings, whereas the CAQ and the PQ are. But all is not lost for the Liberals. They have a historical tendency to out-perform their polls. 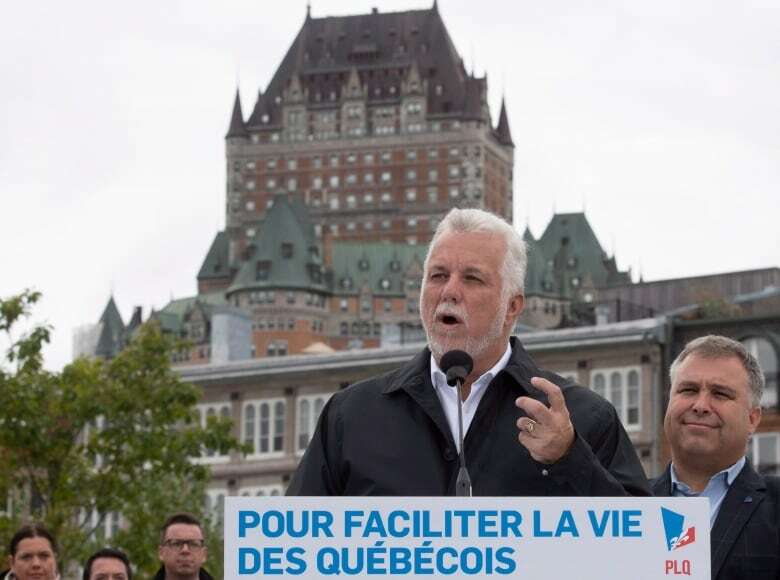 That may not happen in this election — particularly since the possibility of a referendum on Quebec independence, an issue that has helped drive undecided voters to the Liberals, has been taken off the table by the PQ. But in 2012, the Liberals were on track for a third-place showing. Instead, they emerged just four seats and less than one percentage point short of the Parti Québécois. That was a different campaign, however, with three parties splitting the vote between them almost equally. That is not the case in 2018, with the PQ on track for its worst showing and QS changing the electoral landscape in the province. The margin between the CAQ and the Liberals looks close. It could end up that way on Monday. 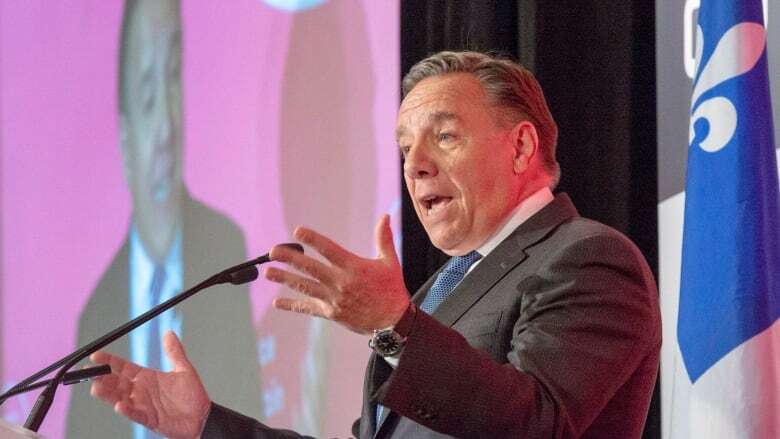 But there is very good reason to believe that Legault, after failing to deliver in his last two campaigns as leader, is finally on track to win. Join us tonight at 6 p.m. ET for a live election Q&A with our political and polling experts Jonathan Montpetit and Éric Grenier on our Facebook page. Will we be doing this all over again very soon?